Itaewon, while known for its multiculturalism, is not considered one of the trendiest places in Seoul. However, from this unlikely source came some of Korea’s up-and-coming trendy streets, all following in the footsteps of Gyeongnidan-gil Road. Located along a narrow side street of Itaewon, this road is lined with small cafés, international eateries, unique accessory shops, and more. At Gyeongnidan-gil Road, and the streets that have followed suite across the nation, the sum is worth more than its parts. Check out these trendy roads wherever they fit into your travel itinerary. Just be sure to NOT post them on social media; you’ll want to keep these places all to yourself! Mangnidan-gil Road, located in the Mangwon neighborhood of Mapo-gu, Seoul, got its start in 2015 and has been rising in popularity ever since. Many small cafés, restaurants, and road shops have filled an area that was once a residential zone. 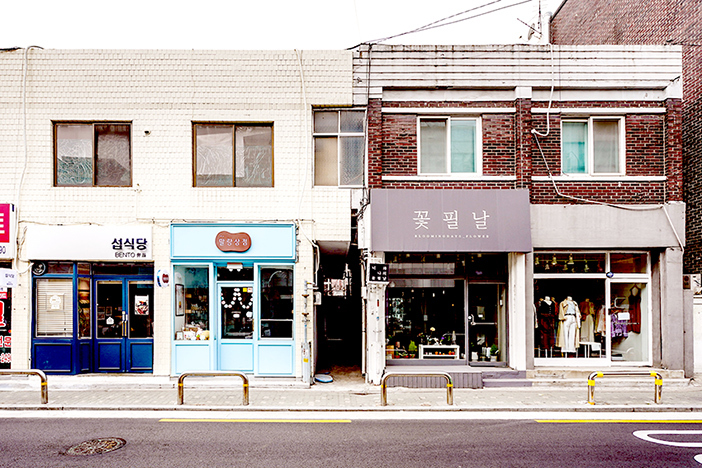 One of the main draws to this particular trendy street is its nearness to Mangwon Market. The market sells typical groceries and household goods for daily living, but also has plenty of tasty marketplace foods. Be sure to try the handmade croquettes! - Walking through the Mangnidan-gil area is recommended, as parking is limited. - Most of the restaurants do not accept reservations, so you may have to wait to eat during peak dining hours. Some places such as the super popular Taeyang Restaurant have a waiting list, but your full group must be there to enter, even if it is your turn. Amidst the offices and private homes that fill the area, Songnidan-gil Road stands out with its line of cafés and small restaurants. While the area always had cafés and restaurants, there was a huge increase in the wake of Lotte World Tower & Mall opening. 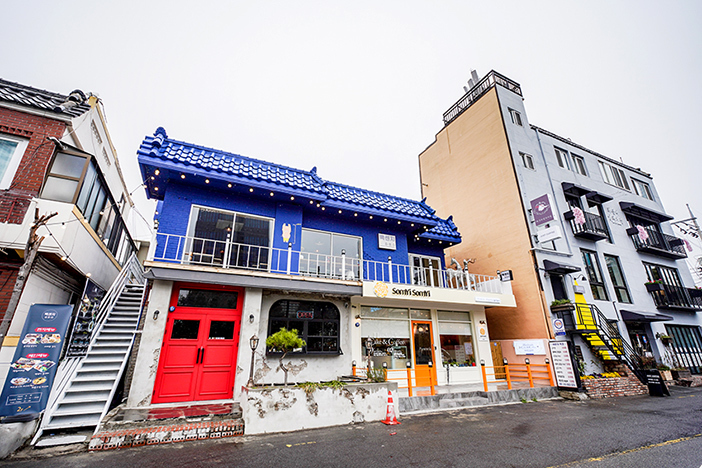 Popular restaurants along Songnidan-gil Road include Mija Restaurant, serving a special myeongnan dongaseu (fried pork cutlet with pollack roe), Gabaedo, Peach Grey, and more. The street is perfect for a stop before or after visiting Songpa Naru Park. - Be sure to check out the information board at Seokchonhosu Intersection, across from the LG Best Shop. The board shows the entire area, with restaurants marked by category, including Korean, Western, Japanese, cafés and more. - Get a Songnidan-gil Road restaurant map from the Songpa Tourism Information Center within Songpanaru Park! 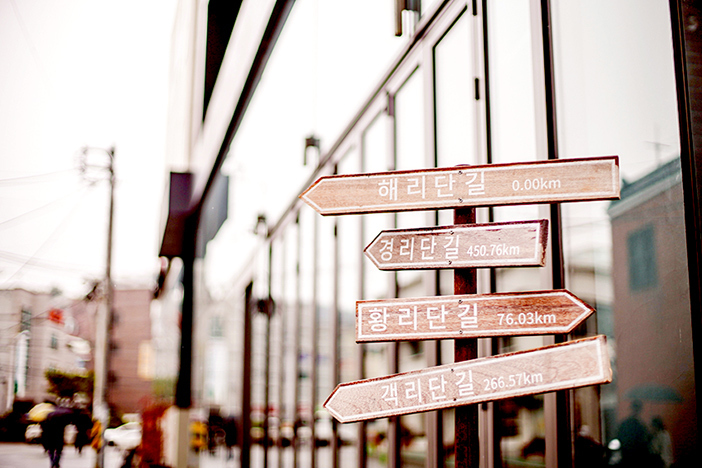 The map features information about 108 restaurants and cafés along Songnidan-gil Road. This helpful guide is available in Korean, English, Japanese, and Chinese. Suwon, just under an hour out of the capital, is a city of history but it is by no means a stranger to change. While the UNESCO-recognized Hwaseong Fortress and Haenggung Palace might be the highlights of a visit to Suwon, the newest attraction is none other than Haengnidan-gil Road. This small street next to the fortress might appear rather boring at first glance, but the area has become quite popular through word-of-mouth and on Korean social media. There are about 90 different shops, each with their own unique style, from modern cafés and exotic pubs to pottery studios and black & white photography galleries. - There are many ways to take in the area around Haengnidan-gil Road and Hwaseong Haenggung Palace, including by bicycle rental, pedicab, the Hwaseong Fortress Tourist Trolley, and even a hot air balloon! The prices vary widely, and some activities may require an ID. Hwangnidan-gil Road in Gyeongju is yet another rising star within a city brimming with historical attractions. Just like a trip to Bulguksa Temple wouldn’t be complete without a stop at Seokguram Grotto, a trip to Daereungwon Ancient Tomb Complex should also include a visit to Hwangnidan-gil Road! 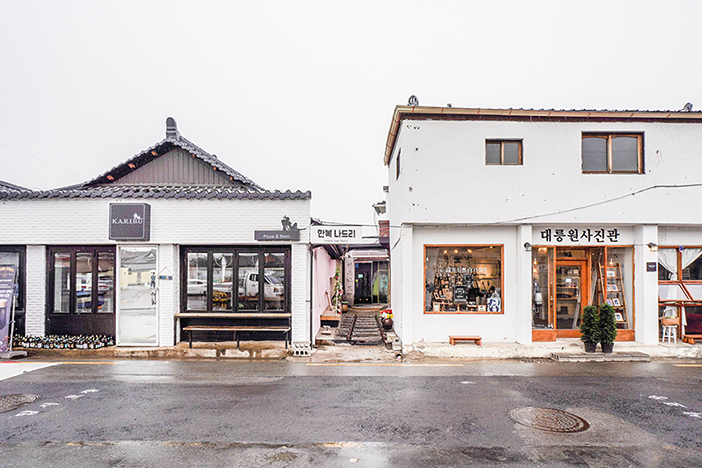 This road perfectly merges Korea’s traditional charm with a modern flair through rooftop cafés overlooking a hanok village, restaurants serving folk cuisine, and shops selling modern-style hanbok. The area was recently selected as one of KTO’s 100 Must-go Attractions for 2019-2020. - If possible, plan to visit on the weekend to also enjoy the Gyeongju Free Market Bonghwang Jangte. The market takes place Saturdays and Sundays in the area north of Daereungwon Ancient Tomb Complex. Stop by to enjoy busking performances, food trucks, and handmade crafts. If you’re looking for the hottest of hot attractions in Busan, look no further than Haeridan-gil Road near Haeundae Beach! Up until 2013, this area was a village next to an active railroad track, keeping people away. However, the space became quite desirable after the line was discontinued, with many private cafés opening up. Each shop is unique and stand-alone, due to having originally been a residence. The buildings are painted in a rainbow of colors, making for outstanding photo backgrounds! - Travel by public transit! The residents tend to use what little public parking there is available. - Wear comfortable walking shoes. The shops in Haeridan-gil Road are often spaced out and separated by private houses so you’ll get quite a workout exploring the area.